If 2016 taught us anything it’s that the internet isn’t fun anymore. It’s not that a soulless network of computers interconnected via TCP/IP was ever supposed to be fun. It’s that eventually fun overlaid itself on that network and created a world where nearly everyone could interact without fear. Kids grew up in a world where it was easier to talk to someone in Malaysia than it was to go next door to play Lego. The internet created a safe place for millions of outcasts who used it to turn themselves into entrepreneurs, artists, and writers. It was a place where intellect could be augmented and discrimination abated. Now all that’s being augmented an overarching sense of fear and meanness. The internet is a force multiplier. It holds our entire lives these days and stores everything from our private longings to our workaday mundanity. It is also our source of entertainment and addictive media and, for many of us, it is a livelihood. Whereas a fun IRC chat and a quick visit to MySpace was once enough to satiate the part of the brain that craved novelty, now we are like rats coming back for an angry fix and marketers and politicians are beginning to harness this power in ways that are at once ham-handed and frightening. The first group who made the internet not fun are who writer Laurie Penny calls “the insider traders of the attention economy.” This is the troll army that turns its baleful eye on target after target, turning a day on the internet into a fight for sanity. 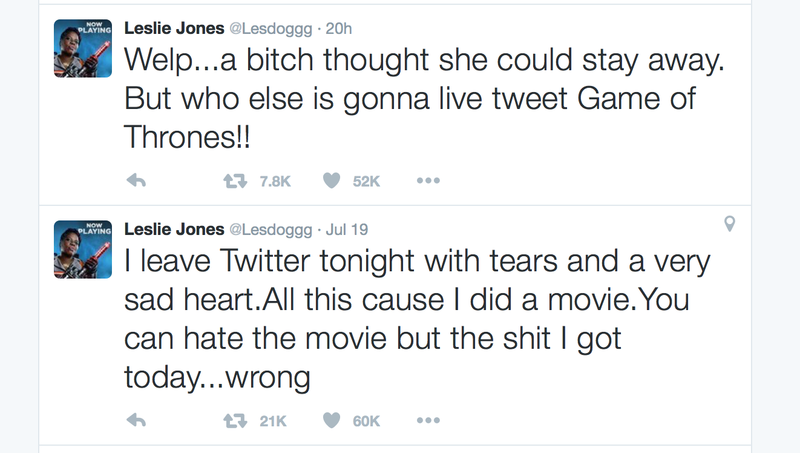 What happened to Leslie Jones, for example, was a course of powerful and unrelenting trolling. Her story, like so many other tales on the new internet, is one of a celebrity’s jovial back and forth with fans that turned into a relentless racist attack. But she wasn’t shot, right? She wasn’t stabbed? The real effects, however, are more jarring. Being attacked on a medium that we never took seriously is odd and unsettling. Many would recall the old adage that “Sticks and stones may break my bones but words will never hurt me.” The guy who wrote that never hung out on Twitter when someone wants to argue with you all night. To be clear no one is truly hurt on the new internet. But the echo chamber afforded by this massive network can have real consequences. Trump’s rise to power came through the internet. Pundits note that his was not a televised candidacy but that is because all of his views were served up in 120 character bites through Twitter. By doing this he created fodder for the online news writers and the outrage trickled down to the moribund TV and newspaper business. The closest corollary were the first televised debates between Kennedy and Nixon that cemented physical appearance as a primary driver towards the Oval Office. The ability to outrage millions in social media is simply the next key to political power. It bears repeating that when the Turkish coup began the government shut down the two Bosphorus Bridge along with Twitter and Facebook. It is an era of internet as weapon and it’s only going to get worse. The internet stopped being fun when it became hard to separate truth from reality, outrage from concern. It lost something when it became trivial to share both cat pictures and beheading videos on Facebook. It lost its innocence when it became the de facto outlet for both ISIS and videos of cops shooting citizens. It stopped being fun when its strengths – the ability to interconnect with anyone, the ability to broadcast to millions, the ability to access the cosmic jukebox and movie theatre at all hours – became secondary to a say-anything, anti-PC form of discourse shed of courtesy and play. Again, I don’t expect the internet to be fun and fancy free. But does it have to be endlessly oppressive? What can we do to make the internet fun again? “In a time of destruction, create something,” said writer Maxine Hong Kingston. Why not try? Create on the internet, share your creations, and interact with the people who like it. Use the tools afforded you – blogs, news aggregators, Product Hunt and Patreon – to make something. The internet was made for humans to talk to humans, not for Amazon to chase us around the internet with viral videos of disposable shavers. In the end the fun I miss is definitely still there. There are thousands of sites dedicated to hundreds of things, great and small. You can find people like you out there and you can remain unmolested in niche areas of the Web. But as a few sites take up the majority of our time we enter a world in which our entire understanding – political, cultural, and professional – is mediated by a worldview created by both human aggregators and robots. This worldview rewards conflict and ignores nearly everything else and this is exactly the worldview that thrives on Facebook and Twitter. In the end we will survive the death of the fun internet. It is a media just like any other and all new media enters a flowering stage and a seed stage. We are well into the seed stage when new media will spring up around the moribund one and the way we interact will further be changed by whatever comes next. I just miss the fun internet. Let’s see if we can’t bring that back, even for a few years.